There are a few items of bathroom decoration that can easily slip under the radar, especially when you’re focusing on the design aspects of the tiles, bath, or units. Though it may seem hard to miss, one of those is the humble mirror. They receive daily use and they’re pretty essential to the morning routine, but perhaps because of that everyday use they tend to get overlooked. However, a good cosmetic mirror or shaving mirror is an important boon for a bathroom and will serve you well over the years. Besides, there’s no point in perfecting the decoration of the room only to have it marred by an old, rusty mirror. 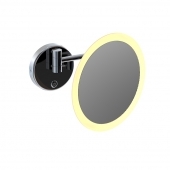 There are some great, affordable options for mirrors that include stylish upgrades on the traditional flat wall-mount, offering more functionality and a modern form. They don’t have to cost more than the bath tub, either; you can save money when you shop online. With a little research you’ll soon find discount mirrors at affordable prices. When you’re trying to find a new shaving or cosmetic mirror, you may be surprised by the range of options that now exist. Designers are moving beyond the basics and depending on your price range, you can get mirrors that really set off the look of the room. These are a few things to look for when browsing. Magnification. Most models have some magnification, to make it easier to see details. You will usually find 2x or 3x magnification options. Adjustable height. This option is ideal if you have height differences in the home or children need to use the mirror too. You may find these mounted on a sliding rail. Angled. For the same purposes as above, you can find cosmetic mirrors mounted on a joint or flexible arm to let them angle downwards or side to side. Hinged arm. Handy if you don’t like to lean over the sink, these can fold outwards to meet you. Lighted. Some models have inbuilt lights, making the image very clear. Ideally, look for LED lights. Two sided. 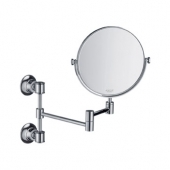 These very functional mirrors have two sides, with different magnifications to suit different needs. Standing. Don’t rule out the classic free standing option, great if you move the mirror around a lot or don’t want to go to expense. These might give you a starting point or inspiration to find your ideal shaving or make-up mirror. Consider also the shape variants on offer, usually round or square. These simple changes in aesthetic may complement or clash with other elements of your room design. Thankfully, there are large ranges of mirrors available from inexpensive designers with an eye for style. You can find suitable make-up mirrors in stores, or better still look on the internet to buy cheap alternatives that don’t compromise on quality. With a little savvy browsing you can find designer brands which specialise in meeting in the middle, with cosmetic mirrors that are inexpensive but also have that modern design sensibility which fits a new bathroom. Two popular manufacturers are Keuco and Emco. 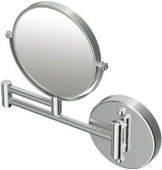 Keuco produce a big selection of shaving mirrors, with a mixture of fittings from folding arms to rail mounts. The Keuco iLook range is perhaps their most impressive mirror for make-up, ideal for a big budget renovation, with a contemporary curved square shape, folding arm for precision positioning and x5 magnification. The lighting on this model is exceptional, with 5 brightness settings, hidden cables and touch screen controls. Keuco have made this a very futuristic shaving mirror, but they also have the Plan range for a more modest option. 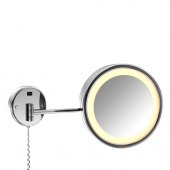 Emco meanwhile have some very minimalist designs, including the U-shaving model; a smart wall-mounted, swivelling mirror for shaving that has a flexible arm. 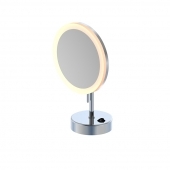 Emco’s Mundo range includes a two-sided cosmetic mirror with flexible arm, LED lighting and a choice of magnifications, a perfect all-rounder for both shaving and a make-up mirror. Picking a bath room mirror is a little more involved than it once was, but the range of options and functionality makes it fun and interesting. Provided that you budget for the ideal mirror for your needs, this humble necessity can become a centrepiece of the room.